A second reason that the MEGA program may not meet its objectives is the problem of deciding exactly what level of MEGA tax credits might truly be necessary to entice a firm to relocate, expand or retain jobs in Michigan. This problem can have a direct impact on determining the correct cost of the program. One reason that MEGA tax credits are not usually viewed as "costly" to the state treasury and to other state businesses is the assumption that the "forgone" SBT taxes would never have been collected anyway, since without the credit, the business investment or activity would never have occurred. To ensure the truth of this assumption, the original MEGA law specifically stated that MEGA must determine that "the expansion or location of the eligible business will not occur in this state without the tax credits offered under this act," and that the tax credits offered under this act help address the competitive disadvantages of Michigan locations with sites outside the state. Indeed, company executives must sign an agreement certifying that MEGA credits made the difference in their decision to expand or locate in Michigan. As described in March 2001 by then-MEDC president and chief executive officer Doug Rothwell: "Not only can we prove interstate competition, we require the company to sign a certification form as part of the MEGA application process. This form, endorsed by a high ranking official at each company, states, ‘I hereby certify that the expansion or location of the eligible business will not occur in this state without the tax credits offered through the Michigan Economic Growth Authority.’"
The actual dynamics of a business decision are probably more subtle and complex than this kind of agreement would suggest, however. Consider briefly the three cases below. In the mid-1990s, the Walden Book Company was planning to move its headquarters from Stamford, Conn., to either Nashville, Tenn., or Ann Arbor. State government wanted to ensure the company would move to Ann Arbor, and the firm became one of the first three companies to be approved for MEGA deals in April 1995. An estimated $7.7 million MEGA credit was part of this deal. After the fanfare of the MEGA agreement died down, The Ann Arbor News reported that the company’s president had put down a deposit on a home in the Ann Arbor area even before the Michigan Economic Growth Authority Act had been passed by the Legislature. The president noted that the company’s board would have compensated him if it had decided against the move to Michigan, but he also stated in 1995, "Management has always expressed a preference to come to Michigan." Also in the mid-1990s, Michigan’s Compuware Corp. was contemplating a "major expansion of both its product development and service staffs" in Columbus, Ohio, instead of Michigan. To ensure the firm carried out the expansion in Michigan, MEGA approved a deal with Compuware in September 1996 worth an estimated $5.9 million. The company was also offered another $450,000 in job training subsidies from the state and approximately $4 million by the city of Farmington Hills for infrastructure improvements made from 1997 to 1999. According to the official "Briefing Memo" on the deal, the annual cost disadvantage for the corporation if it chose to locate in Farmington Hills instead of Columbus ranged from $255,000 to $1,600,000 annually during the 15-year term of the incentive. Less than three years later, it was announced that the corporate headquarters was being moved from Farmington Hills, which had just won the MEGA expansion, to Detroit. This move was estimated by Compuware consultants at the time to cost the company an additional "$16 million to $20 million" annually, although other published estimates indicate only an additional $10 million annually. In either case, the annual cost of Compuware’s move to Detroit appears to be well in excess of the annual cost disadvantage it would have faced by moving Columbus. The result was that no MEGA assistance was obtained. Ultimately, however, the company proceeded to make its divisional headquarters in Novi anyway. The three cases above suggest the difficulty that state officials face in determining just what company officials would have decided in the absence of MEGA tax incentives. Company officials themselves will necessarily face some difficulty in determining what they might have done if no incentive had been present; the outcome of a counterfactual is inevitably a guessing game. Business calculations can change, as may have occurred in the Owens Corning and Compuware cases, so that an unattractive location may become attractive on further review. The potential for a revision of opinion would be particularly high if a firm already had strong reasons to locate in a particular location, despite its apparent cost disadvantages, as appears to have been the case with Waldenbooks. Thus, a resolutely honest company official might well sign a contract stating a MEGA incentive is necessary, even though in the absence of the incentive, or in the presence of a smaller incentive, the official and his business colleagues might ultimately have decided, without being aware of it at the time, to choose Michigan anyway. To the extent that this could occur in some cases, all or some of the tax incentives provided would indeed represent a net loss of revenue. To the extent that this net loss of revenue resulted in higher tax rates on other firms or a reduction in key government services, the effect would not just be lower government revenue; it would likely include lower economic growth. Determining how often MEGA’s incentives are truly necessary is difficult. One approach to estimating how frequently they were truly necessary would be to review cases where firms sought but did not receive MEGA incentives. After nearly 10 years of the MEGA program, a number of companies presumably would have filed applications with the authority that were rejected or abandoned. A survey of those firms today could determine whether they moved to or expanded in Michigan despite their failure to obtain MEGA assistance. To date, we have been able to obtain from the MEDC five applications from firms whose request was denied. These are all of the rejected applicants, according to an MEDC official. We are still trying to determine if this list is truly comprehensive; Bartik has written that MEGA screens out 90 percent of the companies interested in MEGA packages, suggesting that the number of rejected applications would probably be higher than just five. Nevertheless, given the dearth of data, we are unable to perform a meaningful after-the-fact assessment of whether firms ultimately found a MEGA package necessary to their decision to invest in Michigan. Still, there is another sign that special tax incentives are not as critical to company decisions as they might seem. Survey research indicates that executives involved in location decisions generally rank targeted incentives relatively low on a list of factors important to their location choice. Consider a comprehensive survey in 1993 of 800 corporate real estate executives and economic developers performed by the International Association of Corporate Real Estate Executives and the American Economic Development Council. It found that corporate real estate executives and economic developers rated incentive packages 14th of 17 factors listed in the overall site selection process. Graphic 8 shows which factors are most important to these executives in making location decisions. In addition, a 1994 survey by University of North Carolina at Charlotte researchers of 145 North Carolina manufacturers produced similar results. It ranked business assistance by state and local units of government 22nd and 23rd, respectively, among 34 choices. Though all surveys involve certain inherent biases and limitations, these findings are not surprising. Business executives are aware that such tax incentives have a finite life-span and will probably terminate while the facility is still operating. It is therefore likely that executives tend to choose a location based first on where they want their company (or one of its operations) regardless of incentives. At the very end of a location process, incentives might play some marginal role in influencing corporate executives, but on balance, incentives do not appear to be viewed as a fundamental, core factor in choosing sites. Given the many important factors that go into a business location decision, it is quite possible an incentive that seemed important — even necessary — when it was considered could seem less necessary on reflection if it weren’t granted. 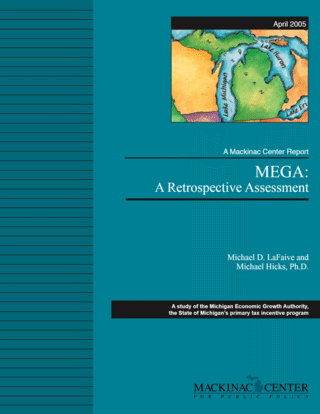 If companies were in fact going to increase employment or build new facilities in Michigan without the MEGA credit, the credit will have no impact — and it might possibly generate negative impact, insofar as the cost of additional government services and forgone tax revenue due to the expansion would now be borne by other citizens and businesses. It might also be negative if less efficient firms receive tax breaks that allow them to gain advantages over more efficient firms in the marketplace. Clearly, despite the best intent of the law and state and company officials, it may be difficult for MEGA officials to determine the real need for MEGA packages. It also seems reasonable that development officers should understand the powerful role that state economic incentives might play in persuading a firm to seek the incentives and to conclude that they are essential to the company’s location or expansion plans.